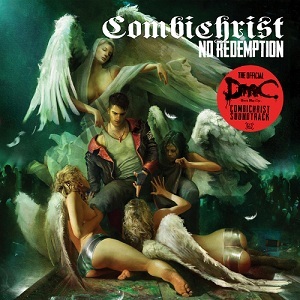 Combichrist's latest release is "No redemption", which is thirteen new songs written for the computer game series Devil May Care. In addition to the standard 13 track cd, ‘No Redemption’ will be released as a limited deluxe 2 disc edition which contains a second disc which contains ten classic Combichrist tracks that are also used in the game. Combichrist have always had a distinctive sound that blends Metal, Industrial and electronic dance sounds. It's a sound that has won them a lot of fans, particularly when they toured supporting Rammstein. Right from the start it's clear things are different. Opening track "Age of mutation" starts promisingly enough with the keyboards, but quickly degenerates into a heavy guitar-driven industrial sound with the keyboards gone apart from a couple of short interludes. "Feed the fire" has more keyboards throughout the song, but the song still doesn't sound like a proper Combichrist song - the keyboards are more background atmospherics here rather than being a core part of the sound. I'm afraid that as a Combichrist fan I was rather disappointed by this release. That's not to say it's a bad album though. If I hadn't heard anything by Combichrist before then I'd have enjoyed this album far more. It is a very good album but I just don't think it's anywhere near as good as their other albums.